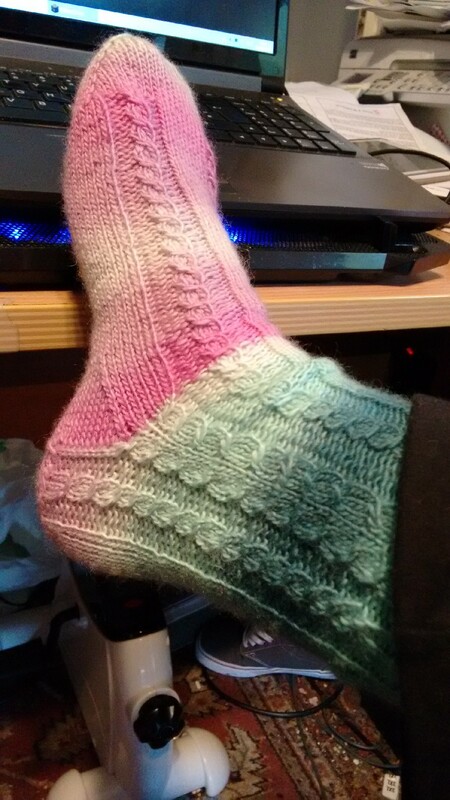 I cast off the first sock of the current pair this morning — yay! I’m a couple of rows into the next one, so yanno, hooray for getting a start at least. I didn’t expect to get much done today because gaming. Maybe I’ll pick up and do a bit more once we have the girls tucked up… we’ll see. I’ve got chores to do first, namely, finishing folding the mass of clean laundry. I’ve got the girls’ clothing folded and ready to be put away, so that’s a start. I’ve half-assedly sorted my stuff into piles to make it easier to put things up. I’ve not touched/organised Z’s stuff, but I’m sure he’ll let me know if he needs the assist. The weather has been taking a turn for the gross again. I was having a helluva time getting to sleep last night. After a couple of hours of tossing and turning, I decamped to the guest bed for the night. Once I managed to finally get comfortable I was out the rest of the night, but still. Age aside, these bad nights really take their toll on me mentally and physically, since good sleep is the cornerstone of trying to keep the chronic fatigue and bipolar happy. I plan on taking some pain meds before going to sleep tonight (since pain was a factor), and I’ve already chucked one of my dwindling supply of Melatonin down my gullet in the hopes it helps make sleep happen better/faster/etc. Right, for better or worse, the kidlets are in their room. I’m going to take my yawnfest back to braining-free climes.